American Dipper on Ketchekan Creek. 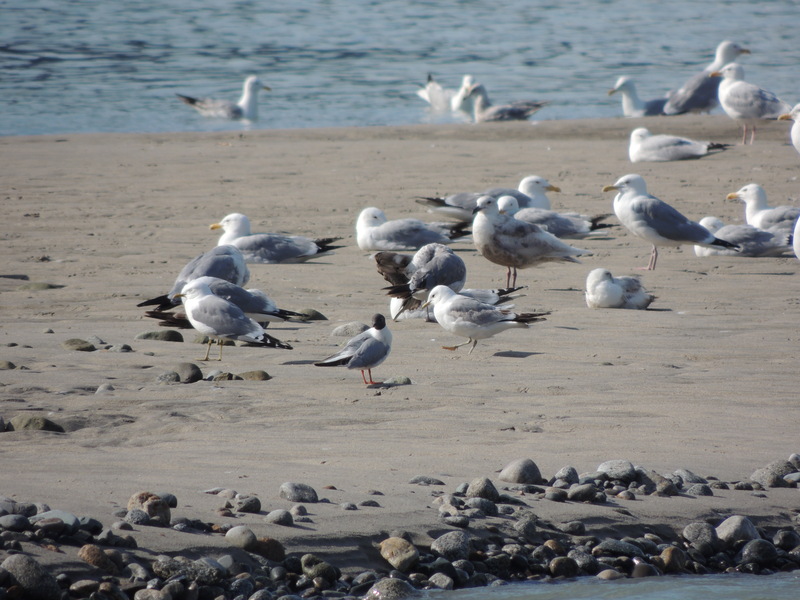 how many gull species can you identify on Dyea flats? 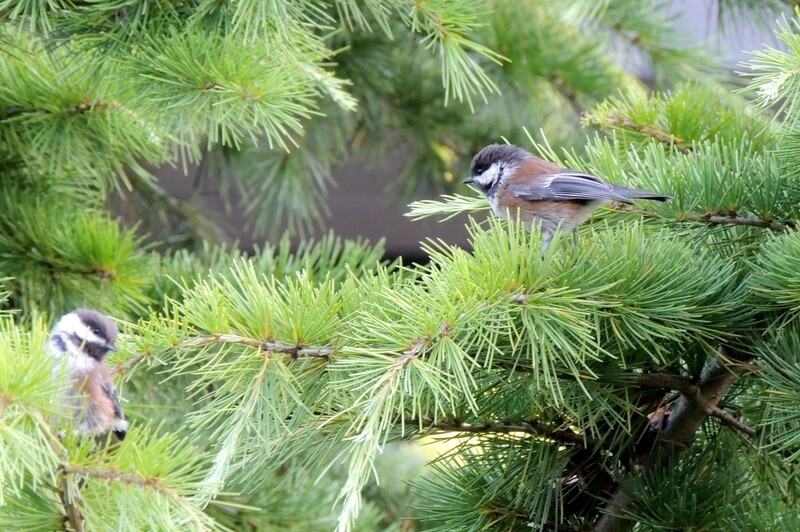 two of five Chestnut-backed Chickadees at the hotel in Seattle. Well here I am again, while everyone was finally getting a chance to sleep in, I was up early exploring the neighborhood. It was quite birdy this morning. The Chestnut-backed Chickadee family included three chicks this morning. 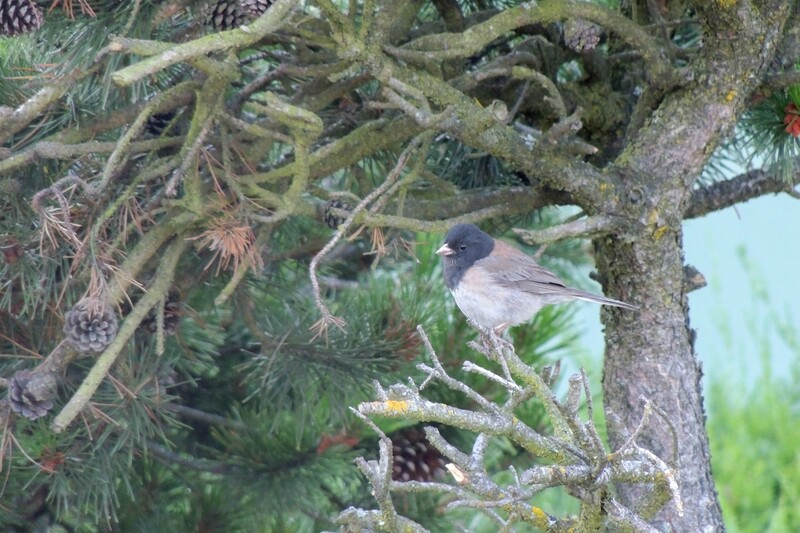 Oregon Juncos were all around the parking area. White-crowned Sparrows were singing and a Bewick’s Wren was foraging in the bushes. A Flicker, House Finches, Northwestern Crows and several Robins rounded out the list. It takes me a while to get used to the birds calls and songs when I come west, but I’ll get them down in a couple of days if I ever sit still that long. Great morning here. Still haven’t heard an American Crow. We toured Seattle Center most of the morning. There are beautiful gardens, museums, entertainers etc. It was a nice morning. For me the best part was more birds. Common park species were all present. I was able to add three new birds. GLAUCOUS-WINGED GULLS were very common, and I found a lone BUSHTIT foraging in the trees. With so many flowers, I was sure there would be hummingbirds around, but at first I couldn’t find any. I was sure Rufous Hummingbird should be there. A short time later, I heard a squeaky song and should have recognized it, but didn’t. 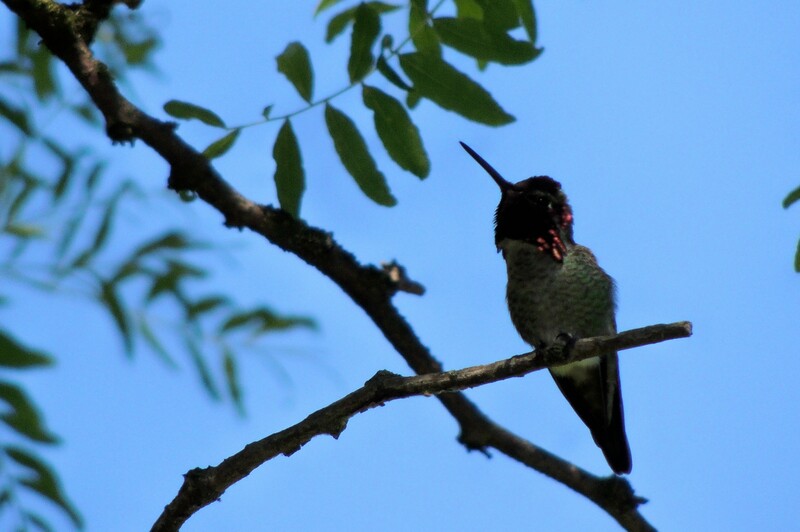 I tracked it down and was pleased to find an adult male ANNA’S HUMMINGBIRD perched over some plantings. I wasn’t expecting that hummer, it was a new state bird for me. We left the park and boarded the ship for the cruise. By 4pm we had set sail and were headed out the Strait of Juan de Fuca. It wasn’t long before we ran into a bird feeding frenzy. I don’t know what they were feeding on, but at least 100 Glaucous-winged Gulls and 50 RHINOCEROS AUKLETS were feeding in mass. It was nice to see my first alcids of the year. We sailed up the west coast of Vancouver Island. When you reach the northern end of the island beginning about at Cook’s Point, you begin to see the birds. 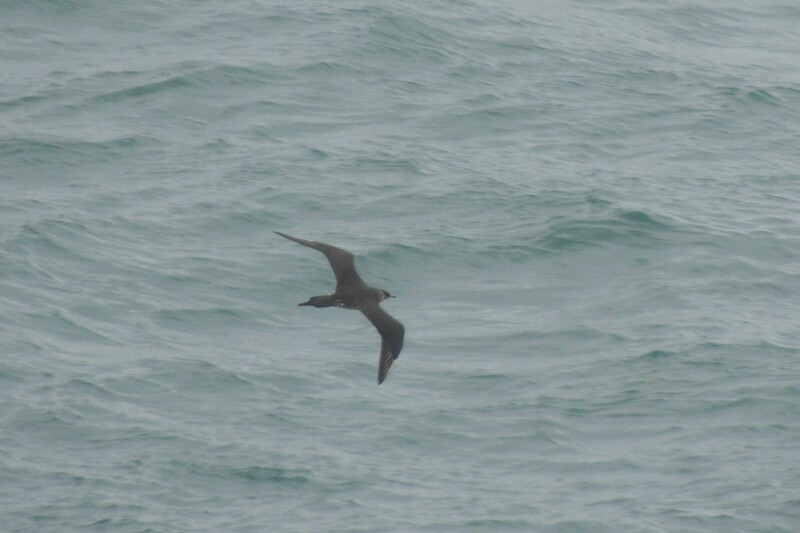 I immediately found BLACK-FOOTED ALBATROSS, followed shortly by many SOOTY SHEARWATERS. A little later came the first PINK-FOOTED SHEARWATERS. Shortly after that, the ship sailed into a fog bank that lasted most of the afternoon. When it cleared, I had a few more of the above species and a total of ten COMMON MURRE. At about that time we had passed the good area for birds and little was seen for the remainder of the day. We continued sailing northward into Chatham Strait and then into Stephen’s Fiord toward Juneau. We have just reached Juneau and can’t disembark for a half hour so I thought I catch up. As we got closer to Juneau, we saw at least a dozen Humped Back Whales and six Orcas. A few porpoises passed, but not sure which species. Salmon were jumping close to shore. At this point, Bald Eagles, Northwestern Crows, Bonaparte’s and Herring Gulls were all seen. Many MARBLED MURRELETS passed by as the ship flushed them from the water. Also among them were three Common Murres. We are about to head up Mt. Roberts, will keep you posted. There wasn’t much happening bird wise on Mt. Roberts. It wasn’t fogged in and I was able to go much higher up than on my last trip. I searched all the appropriate habitat to no avail, no ptarmigans. This trip I couldn’t ever find a Sooty Grouse, though the rangers assured me I most certainly would. There were many Oregon Juncos and Orange-crowned Warblers. Another bird I saw was an American Pipit, and I heard a couple more of them. A Bald Eagle was the only other bird. I spent so much time on Mt. Roberts that when I came down I found out I had missed the last shuttle to Mendenhal Glacier. Oh well another time. As I have previously experienced, Skagway once again offered the best land birding of the trip. I rented a car while all of my friends shopped and took the train to White Pass Summit. 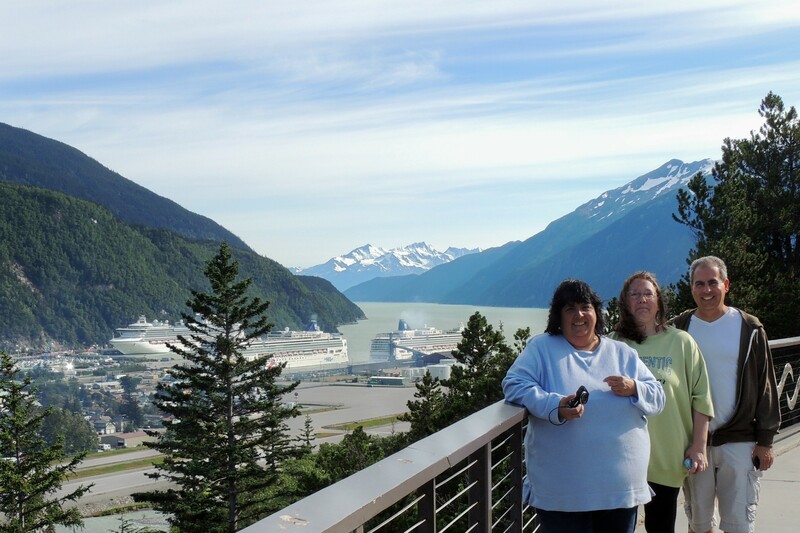 We had fourteen hours in Skagway which enabled me to cover many locations. I started around town. As in the past, 2nd and 3rd avenues had many bird feeders. Here I saw STELLAR’S JAY, RUFOUS HUMMINGBIRDS, Chestnut-backed Chickadees, Yellow-rumped Warbler, Eurasian Collared Dove, Violet-green and Barn Swallows. Near Taiya Inlet, I had many species of gulls. Herring, Bonaparte’s, MEW GULL and Glaucous-winged Gulls. I also had my first two ARCTIC TERNS at this spot. Marbled Murrelets were in the bay. From there I headed out Dyea Road. Many more of the same woodland birds were seen and I had my first Ruby-crowned and Golden-crowned Kinglets. Also along this road I had many Chestnut-backed Chickadees and Oregon Juncos. As I neared Dyea, I found a family of Slate-colored Juncos, a first for me in Alaska. Common Mergansers were in two of the inlets along the road. When I got to Dyea, I birded the flats. This is a wide, long expanse of grass and mud flats in Dyea Bay. It was quite birdy here. I had many Savannah and Lincoln’s Sparrows in this spot as well as Common Loons, Mallard ducks and all the above mentioned gulls and terns. In the woods near one inlet, I found a pair of TOWNSEND’S WARBLER feeding several chicks. In the spruce forests as you enter the flats I had many Hermit and Swainson’s Thrush and the only VARIED THRUSH of the trip. I then went farther out Dyea Road where I had many birds. Most were the same I had seen, but a beautiful WESTERN TANAGER feeding young was a nice find. As I headed back toward Skagway and passed Dyea Flats again, I spotted a SANDHILL CRANE. I stopped and got a few shots of it before it took off and headed out the inlet. I see on ebird there have been a couple of reports of them there, but it was a surprise and new state bird for me. From here I returned to Skagway and took the South Klondike Highway north to White Pass Summit. En-route, I had many of the same species I had been seeing. When I reached the “Welcome to Alaska” sign I was speaking with a young man from Canada. As we spoke I heard a song I couldn’t identify. 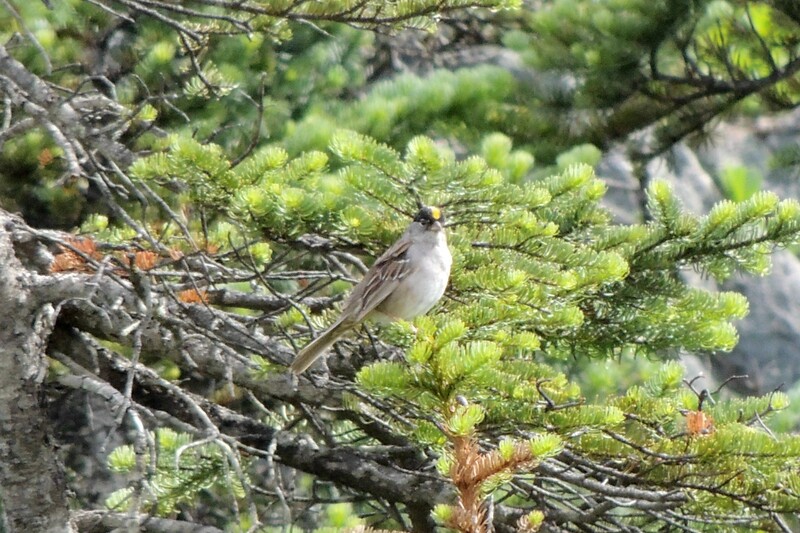 I got a poor glimpse of a bird that I immediately new was a GOLDEN-CROWNED SPARROW. Some spishing a bit of a chase resulted in the bird popping up in a tree a bout fifty feet from me. Great views. This is only the second time in my life I have seen this species. A second bird joined it (a pair) and gave great looks until I left. As I headed back down the highway, I came upon a flock of Mountain Goats, five in all. I returned to Skagway where I hiked the mountain trail to Lower Dewy Lake. I had more of the same species there. A total of 37 species were seen in Skagway which was by far the best spot on the trip. On Thursday, we spent the day sailing through Glacier Bay NP. 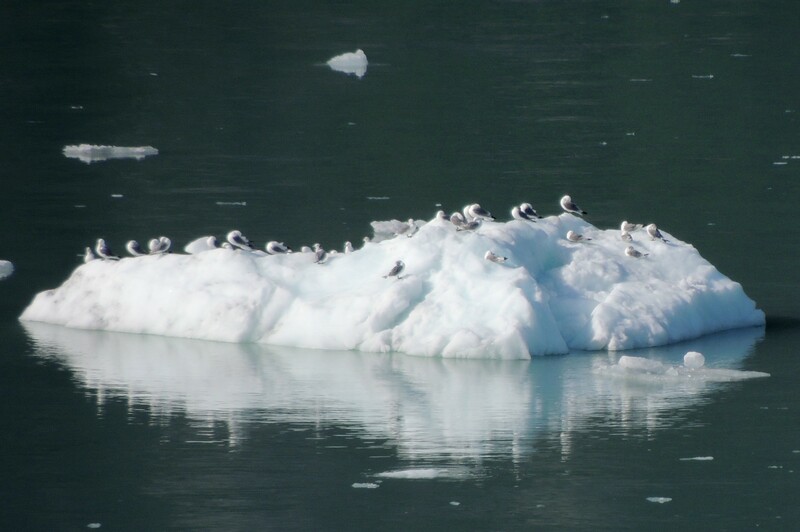 This is a 60 mile long fiord with many glaciers and inlets that abound with birds. This is a special spot to bird and always a joy. I was up early, 5am to position myself on deck before we entered the park. I made it just in time, we crossed the boundary at 5:30 am. You know you are crossing into the park because there is an under water moraine that appears as a line of turbulence right across the bay. This spot abounds with birds. BLACK-LEGGED KITTIWAKES, RED-NECKED PHALAROPES, Glaucous-winged Gulls, Marbled and KITTLITZ MURRELETS are all easily seen. As we progressed on, Hump-backed Whales were spotted throughout the park. A couple of Pacific White-sided Dolphins were seen, as well as a number of Harbor Seals. Continuing on, we passed my first group of 13 TUFTED PUFFINS. It seemed like there was no point that there weren’t some birds or wildlife to be seen. Farther into to fiord I found my first PIGEON GUILLEMOTTS along with many more Tufted Puffins. A couple of Arctic Terns were nice to see here as well. The park ranger came on the loud speaker announcing that a moose was on an island we were approaching. At first I couldn’t spot it, but then it came out into the open for a couple of minutes, walking along shore. As we neared Marjorie Glacier, I spotted my first PELAGIC CORMORANT of the trip. I would have another five of them that day. This was considerably lower than on my previous trip where I had had quite a few all along the route. 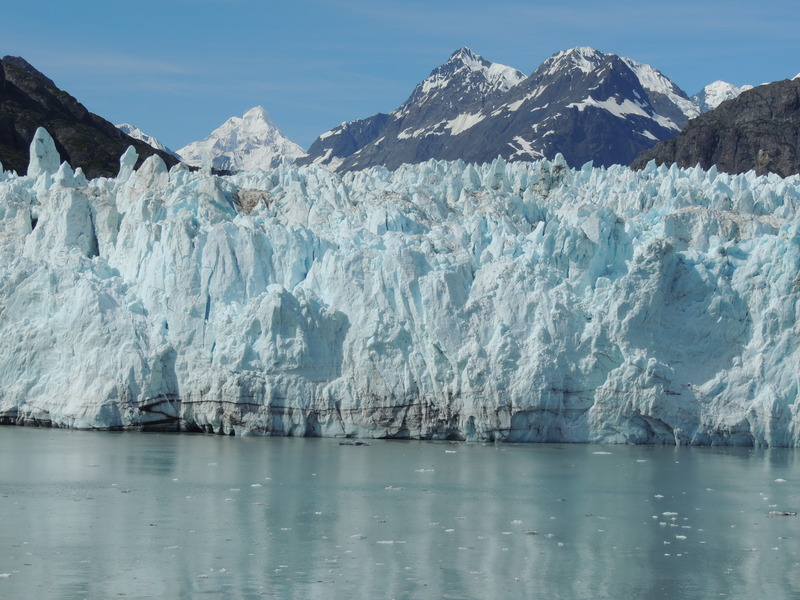 We eventually turned around after viewing several glaciers up close and having them calve. Beautiful scenes were all around us. On the trip out, I had many of the same species again and was disappointed not to have found any Horned Puffins on this trip. As we neared the moraine again, I spotted a jaeger. Hoping it would turn out to be a Long-tailed, I was still thrilled to see a PARASITIC JAEGER. I would spot several more, trying in vain to get a shot of one. A short time later, I looked down and three were riding the wind in front of the bow. I was able to get several identifiable shots of these great birds as they harassed the gulls for food. This was a great day with beautiful weather and many birds. This location in Southeast Alaska is often rainy. We had several hours of clouds and finally rain. It was similar to Juneau in that I didn’t have that many birds here. I did however find my first of the year AMERICAN DIPPER on Creek Street. I didn’t have it right in town, so I followed the creek farther up hill about half a mile, maybe less, and found one there. oddly enough, I was walking down North Tongass Highway and found a family of House Sparrows. These were my first House Sparrows ever in Alaska and had to be entered in Ebird as a rare bird. I’d have taken photos if I had known they were that rare, but as you might guess, I didn’t think that much of it at the time. We departed Ketchekan in the afternoon, soon making our way to Dixon Entrance. This is a spot where the inside passage meets open ocean and it was quite birdy. Unfortunately, it didn’t happen until we had passed into Canada waters, so I couldn’t add the birds to my Alaskan list. Highlights here included Sooty Shearwaters, FORK-TAILED STORM-PETRELS, Tufted Puffin and Marbled Murrelets. The following morning we were passing the northern tip of Vancouver Island when I awoke and this was the least birdy morning at sea. I don’t why that happened, because this is usually a good stretch. As it was only a few Sooty Shearwaters and Marbled Murrelets were seen with the ever present Glaucous-winged Gulls. As we neared the south of Vancouver Island, it picked up again and I had many (135) Sooty Shearwaters, 2 Pink-footed Shearwaters, Marbled Murrelets and 7 NORHTERN FULMAR, the first of the trip. We docked in Victoria and toured the town, but I had no significant bird sightings. We arrived the next morning in Seattle and dis-embarked by 10am. 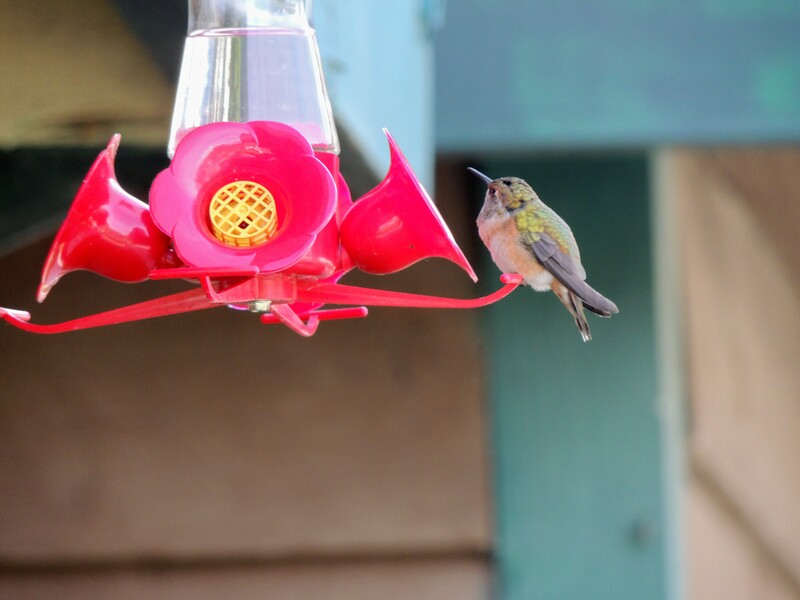 As my friends all went up in the Space Needle, I birded, finding a couple more Anna’s Hummingbirds. I find this amazing since I had never had one in Washington in three previous trips. We now start the long journey home. If I have any significant birds on the trip, I will post something, if not see you when I get home. On our way east, we stopped at the site of the “Battle of the Little Big Horn” where General George Armstrong Custer met his fate with the tribes of the Lakota Indians. It is a fascinating historical site and well worth a visit. It is also quite birdy and while I didn’t add any trip birds there, I had some nice sightings. Several Bullock’s Orioles were attending nests hung high in the spruce trees. They would come and go frequently with food for the chicks. Many Lark Sparrows were scattered about the grounds and recently fledged Common Nighthawk chick was seen perching on a bare branch. Spotting me taking pictures of it even got some other tourists interested and were fascinated by the way it blended in so well. Eurasian Collared and Mourning Doves, House Finches, Chipping Sparrows, Cedar Waxwings etc made for a nice list. Not far from there, I had my first Black-capped Chickadee in Montana and for the trip. Heading east. This was a fabulous trip! We drove a total of 6,300 miles and cruised approximately 2,000 miles round trip. I had 130 species of birds, adding 10 new species to my Alaskan list. I had no life birds on this trip. We visited 3 National Parks, 3 National Monuments and 1 State Park. I will eventually post the list of birds and one of mammals, which is also impressive. I would recommend that anyone contemplating a trip like this plan well in advance and make all arrangements for travel and lodging before you go. It helps a great deal. I would also recommend that more time be set aside for the trip. We had 18 days and it wasn’t really enough time. Lastly I’d like to thank my friends Theresa, Kim and Mark for making this a wonderful and memorable trip. Fantastic! Thanks for describing and taking photos. John – I finally got a chance to catch up on your big road trip. it looks like you have had some amazing birds and the photos have been great. The wolf must have been really exciting to see and photograph. I look forward to more posts. Always a pleasure to follow,John,great job.By the way,this is my first Email. Thanks Danny, glad you enjoyed it and congrats on the email! What a year you’ve been having! thanks for sharing the wonderful stories and the great photos. Thank you for sharing your adventures with us. It is a joy to see all the new bird species I’ve never seen before.